What started as a way to help a Veteran's wife has turned into a mission to help all disabled Veterans. A local woman was paralyzed after a car wreck. She lost her job, even her dignity. Her husband invented a wheelchair that not only gave her freedom, but her life back. "It will open so many doors for them," said Liz Soden, describing life in her "Mongo" wheelchair. Before her husband Brad invented the Mongo state of the art wheelchair for her, she constantly felt judged. "When I'm in my Medicare chair, people don't talk to me, they will turn away; I've had people walk across the street, so they wouldn't have to be next to me," said Liz, who missed participating in fun outdoor activities with her family. Brad, an Army Veteran who served overseas with the 3rd Infantry Division, invented the Mongo wheelchair to be all-terrain, with speeds up to 25 miles per hour. It includes features that allow the user to stand up or lie down. 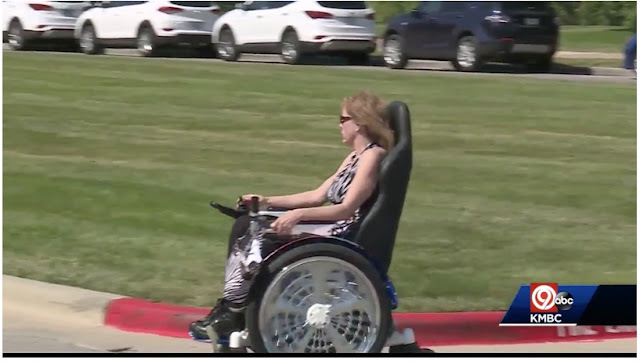 "When I'm in this, people actually come up and they want to talk to me, I'm a person again, and I have a conversation, and I can say stuff; normally they don't even look at me," said Liz, who mentioned the Mongo chair allowed her to smile again. "A lot of these guys are eating bullets, and want to, they think it's better for their families if they're not around anymore," said Brad, referring to the helpless feeling disabled Veterans have when they lose their independence. One of the goals of the Mongo chair is to stop Veteran suicide because it's designed to give Veterans purpose and direction; making them employable and able to participate in activities with their families they otherwise couldn't. Brad hopes to raise one million dollars to gift a Mongo chair to all 60,000 American Veterans who currently use a wheelchair in their day to day life. "Somebody being hurt, it's just not their issue, it's a family issue, so that's what we're about, is coming up with solutions," said Brad.